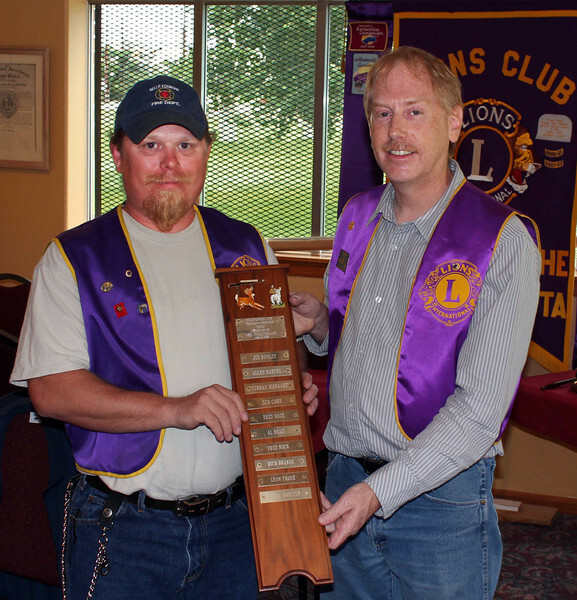 Lion Rick Bartels (left) receives the traveling Lion of the Year award from Belle Fourche Lions Club president Brian Kline. Bartels, who served four years as club secretary before assuming the vice-presidency this past year, will become club president for next year. As Lion of the Year he joins a long list of fellow Lion who've been honored each year since 1958. Among other recent winners have been Lions Al Shaw and Rich Drabek. The award was presented on Thursday, May 24, 2012, at the final club session before a summer recess. Although the club will have no formal meetings again until next fall, a variety of key projects will be pursued during the summer months, including the All-Car Rally and the Black Hills Roundup, for which Lions have been key participants for many years.